The scaffold erected around Mushroom Rock to reposition it. The rock was topped by a winter storm in 2005. Mushroom Rock being lowered onto the 4" stainless ship shaft to amekt he repair durable. The Mushroom Rock in Bahia Balandra has long been the symbol of La Paz Appearing in postcards and countless photos. Sometime in the winter of 2005 the rock was discovered toppled from it’s location by local residents. 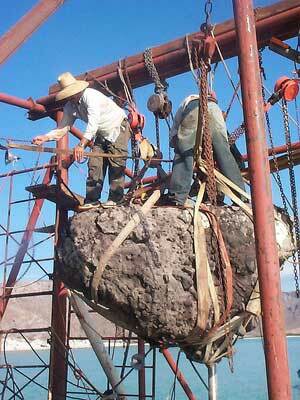 When the rock fell the La Paz business community came to its rescue. "El Hongo" or Mushroom Rock is visited daily by dozens of tourists willing to wade around the point from the main beach. Although it may not be as spectacular as Gibraltar or the Arch in Cabo, the people of La Paz are quite proud of the symbol of their city. The Rock is a precariously balanced 18 tons of composite sedimentary rock, sculpted over the centuries into its current form. The rock stands just away from its mother point in shallow water. It stands about 12-14 feet tall and is about 10 feet in diameter at the top. Located on the north shore of Bahia Balandra, about 9 miles north of downtown La Paz, the rock is protected from most of the wave action of the Sea. Unfortunately, the forces of nature that sculpted the rock from the point will also eventually destroy it. But the people of La Paz have denied Mother Nature her way before and when the rock toppled last winter, they came to its rescue. Since the rock is located out of sight of the main beach parking area and traffic to the beaches at that time of year is limited, it is not know when the rock fell and what may have caused it. An unusual storm a few days before the discovery had brought strong wind and waves from the west. That direction is the only real exposure the rock has, with a long fetch to the western shore. The fragile base on which the rock sits could have been hammered for 24-36 hrs by waves of a size that rarely enter the Bahia. It is suspected that the rock fell from “natural causes”. This is not the first time the symbol of La Paz has fallen. In the early 1990’s the rock had to be remounted following an incident of non-malicious vandalism as I had heard it called. In the process of researching this article I discovered the rumor that the event was actually recorded on video tape. As the story goes a Japanese tourist was videotaping a group of his friends dancing when the rock fell. Allegedly there were some minor injuries and the perpetrators were not prosecuted, as the logic was it must have been about to fall anyway. I was unable to located the video tape or officially confirm the story. However, within a few months the rock was ‘mysteriously’ found back in place. When the rock fell this time the La Paz business community came to its rescue under the leadership of Abel Bercovich of Talleres Navales Bercovich (Bercovich Boat Works). The local organization of Travel and Hotel Businessmen helped underwrite some of the physical cost of the project while Abel Bercovich and company provided the manpower, equipment and logistics to right the rock. The task was a daunting one. The rock weighs between 18 and 20 tons. The shallow waters around the rock are foul with large sharp rocks that remained after the softer stone of the point were eroded. There are no roads or access to the point via land. The project was expected to take several weeks, so between the difficult location and time required the obvious solution of a marine crane was both unfeasible and too expensive. With all that in mind, Abel Bercovich engineered a method to reposition the rock with Mexican ingenuity and pure brute force. The first step was to create a superstructure that could support the weight of the massive rock. Using 6” steel pipe a cube was constructed around the rock that would support the restored rock in the lifting effort. A series of chain falls, belts, chains and ropes would be used to raise the rock and support it while the repairs were made. The structure was precut at the Bercovich yard, near the entrance to the Ensenada de La Paz and transported by small boat to the remote location. They were then welded together and the base cemented in place for the Herculean task ahead. Since the rock is not one solid piece, rather a composite of lava flow, sedimentary rock and moderate sized stones the first concern was that the rock may have been damaged in the fall. It also meant the rock would have to be handled with great care to avoid destroying this local treasure. Since Balandra is more than 7 miles from the Bercovich Boat Yard a base camp had to be established and power generation and welding equipment had to be floated out to Balandra. Once all the materials and equipment were in place the raising of the rock could begin. To further complicate the effort, the summer heat would require plenty of food and water for the laborers working on the project. As one of the laborers said to me, “We may have to work hard, but at least we have the Sea here to cool off. After the frame was completed a new manner of supporting the rock had to be devised. The base had to maintain the natural look of the eroded rock while providing enough support and durability to keep the rock upright for the next generation. Mr. Bercovich decided to use a 4’ long piece of 3” stainless steel drive shaft, drilled into both the rock itself and the base. After the rock was in place a series of smaller support rods, similar in design to the tiny prongs that hold a diamond in a ring, would be welded in place to increase the support. The entire new support structure would be hidden by smaller rocks glued in place with mortar and marine epoxy. First, a hole was drilled into the foundation rock. Finding square and true was easy when drilling straight down into the existing rock. The soft rock yielded rather easily to the masonry drill and the support base and shaft were quickly in place. Finding the correct axis on which to drill the receiving hole in Mushroom Rock itself proved more illusive. The rock had spun as it had fallen and now resting on its side in several inches of water it was difficult to calculate the angle to drill the support hole so the rock would sit once on the support. The task was made even more difficult as, with the rock on its side, it was difficult to apply force to the masonry drill. Once the support and receiving hole were ready, it was time to lift the rock. The rock was encircled with a series of ropes and cargo straps that served to both lift the rock and keep it from breaking apart under its own weight in the process. Since the rock would also have to be spun and tilted, the chain falls were connected on various axis to allow for the movement. The lifting of the rock went relatively smoothly. There were a few tense moments of course when chains slipped or lifting straps groaned. These events were usually accompanied by a dozen sets of saucer sized eyes and the holding of breath, but everything went off without a hitch. 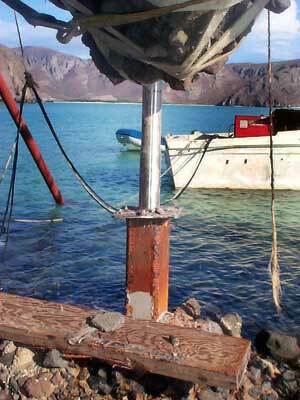 Once the rock was position over the supporting pedestal marine epoxy was stuffed into the rock and it was lowered into place on its new mount. The large quantity of epoxy generated a great deal of heat on the warm September evening and there were some tense moments as the epoxy began to set up before the rock was in final position. Great care was taken to make sure the attitude and rotation of the rock was as similar as possible to its original state. Over the next several days the placement of the rock was fine tuned with additional drilling and force, applied by the crews on the work platform. Once the final position was achieved the smaller support rods, about 1” in diameter, were welded in place to add strength. The entire new support structure was then hidden with smaller rocks and colored mortar to very closely resemble the natural appearance. Since the surrounding rock is of similar composite construction, the new repair blended in nicely. The scaffolding came down in the third week of September, 2005. Some final touch up where the support structure had been and to the base of the rock, but by October it was difficult to tell that the rock had been anything but solidly in place. Today travelers from all over the world visit Mushroom Rock in Balandra on a daily basis. So next time your in La Paz, venture out to Balandra and take a few pictures. While your there you will be able to relate a little Baja Insider information to the other tourists about how the business community of La Paz helped save the symbol of this fine city. Thanks to Bercovich Naval for their efforts in repairing this landmark.